Residents of San Andreas on April 30 toured the unincorporated community’s wastewater treatment facility. San Andreas Sanitary District Manager Hugh Logan reported that more than 45 residents came out for the event. Logan said many had never before seen the facility. Longtime Operators Jack Wilbur and Josh Weatherby led the plant tours. San Andreas Sanitary District employees also offered a yard sale during the tours. There were more than a 100 items for sale, including a jack hammer, compressor, yard trailer and wood splitter, not to mention odds and ends like an old file cabinet and used chairs. All of the used items were declared as surplus by the district board of directors. Ratepayers received first dibs to purchase. 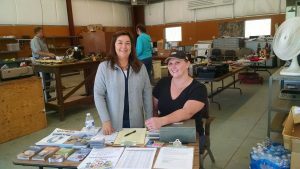 Employees Denise Betten-court, Lynette Rapetti and Erik Hamann organized the yard sale and provided refreshments to customers who ventured out. San Andreas Sanitary District receives and treats 250,000 gallons of sewage every day. In 2015, all samples of treated effluent were 100 percent compliant with California regulations with no violations of water quality standards.